The 73-storey Trellis skyscraper now approved. 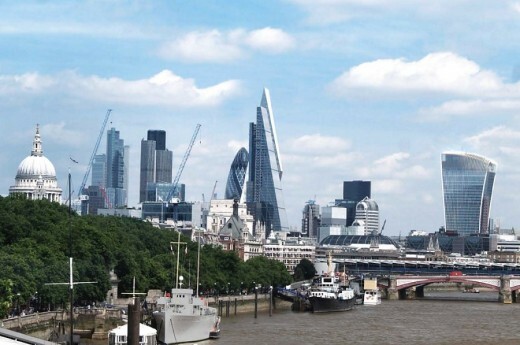 The tower is due to become the second tallest building in western Europe after the Shard. It will include a free public viewing gallery and ‘London’s highest restaurant’. The development is for Singaporea developers Aroland Holdings. It was originally to be the height of The Shard but was reduced because of London’s airspace restrictions. 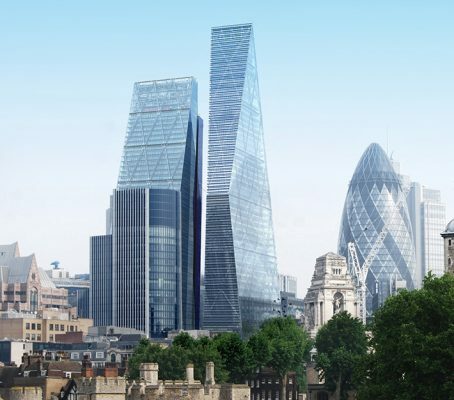 There has been criticism of the plain rectilienar shape (the architect desired the design to be “calm”) and of it being too close to existing towers such as The Cheesegrater and The Gherkin. Planners set to approve City’s tallest tower, reports Building today. The 1 Undershaft skyscraper by London architect Eric Parry is poised to receive planning permission, despite daylight issues on surrounding area. 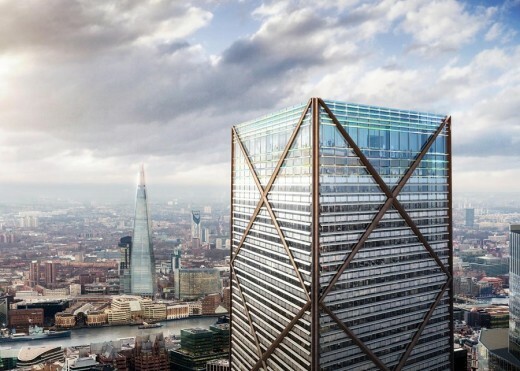 This skyscraper, nicknamed ‘The Trellis’, could become London’s second tallest building. Eric Parry has submitted plans for a new tower at 1 Undershaft, reports the Architect’s Journal. The 73-storey skyscraper would reach the same height as The Shard by architect Renzo Piano. The tower would dwarf the neighbouring Gherkin by Foster + Partners and almost match The Shard in height, reports The Standard. 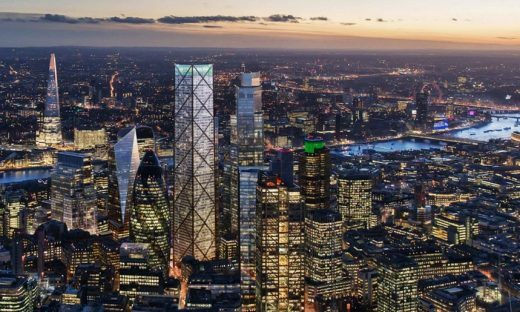 The 73-storey building, has been named 1 Undershaft and will be 309.6 metres tall – exactly the same height as The Shard and the maximum allowed by the Civil Aviation Authority. The building would become the tallest building in the City of London. However, its pavement to peak height will be around 7m less because The Shard sits on slightly lower lying land. 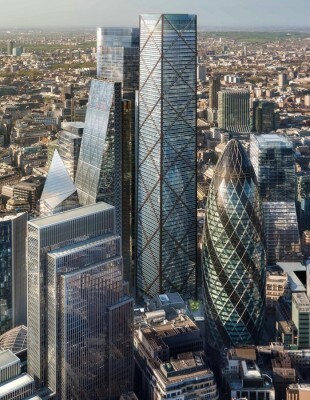 Sitting between the Gherkin and Leadenhall Street’s Cheesegrater, it will be the tallest in the City financial area and will join a raft of a new skyscrapers planned for the capital, including an as-yet unnamed tower at Canary Wharf and the Morello Tower in Croydon. At the summit of The Trellis building will be a free public viewing gallery: it will be higher than the same area in the Shard; there will also be an education centre for school trips and a restaurant. The tower was commissioned by Aroland Holdings (Singapore). 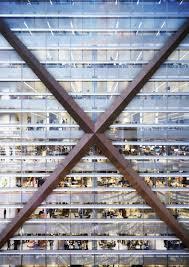 The tower designers, Eric Parry Architects, also created the headquarters of the London Stock Exchange in Paternoster Square. The public elements of this skyscraper building will mean it is in use seven days a week, unusual for a London Square Mile tower. It would beat the recently resurrected development at the former Pinnacle site at 22 Bishopsgate in terms of height. That skyscraper building cleared planning in November 2015, will have 61 floors and be about 280 m high. 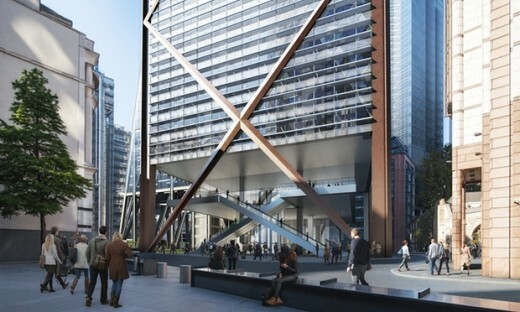 Plans for 1 Undershaft have been in the offing since July 2015. They will have to be submitted to the City of London Corporation for approval. 1 Undershaft is a proposed skyscraper for the City of London financial district. The proposed tower would replace the St Helen’s tower, and upon completion become one of the tallest skyscrapers in London. In January 2015 plans emerged of a replacement office building for the St Helen’s tower in Undershaft. The proposal, named 1 Undershaft, was designed by Avery Associates for the then owner of the site Simon Halabi in 2010. With a height of 270 m (885 ft) it would have become the third tallest building in London and the United Kingdom behind The Shard and the stalled Bishopsgate Tower.